Are you worried for your Financial Expenditure for Upcoming Year? Here is a way you can find (financial Horoscope Prediction 2015) according to your Horoscope. 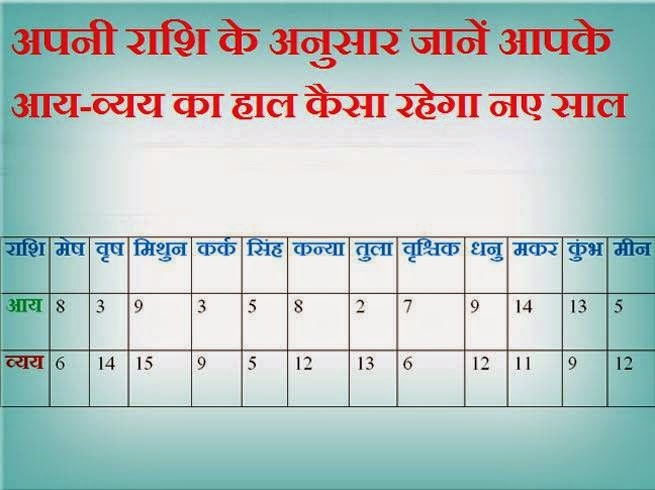 below is an image by which you can find the Income and expenditure Prediction for your upcoming year by your horoscope. To check how will be your upcoming financial year, below is image and method to check it with example. Method of Viewing Income – Expenditure: Join the number according to your moon sign or name. Subtract 1 number after adding them and the 7 number would be your fruit. How to find your number? For Example: Neha’s sign is Scorpio. In which income is 7 and expense is 6. The total is 13. 12 will come after subtracting 1 out of this. 7 numbers will survive at the end of 5 full points. In the above analysis, the fruit of 5 means low income and expenses are shrinking accordingly. That will reduce costs because of low income. Other signs’ income and expenses can be extracted. 1: If the number would be 1 then next year your income would be good and expense will be less. 2: It means the income and expense would be same. You do not have shortage of money. 3: It means your income will decrease and expenses increases. 4: It means you may get new sources of income and expenses also incurred according to needs. Your financial position will be good. 5: It means your income will be low and expenses also decrease. 6: It means you will find difficulty getting income or you may not get it. You have to make control on your normal expenses. 7 & 0: It means you will get good income but you cannot control your expenses.